Y'all, summer is just around the corner, and I can't wait! One of the best things about this time of the year is the fashion. Stores are always filled with fun, bright prints and adorable accessories during the summer season. In my opinion, jewelry is an absolute essential to complete any outfit. It can really act as a finishing touch that pulls everything together and just gives it that extra little oomph. Summer jewelry collections have always been my favorite. They tend to be more colorful and enticing, which I love! A simple, plain tank can take on a whole different look with the perfect statement necklace. 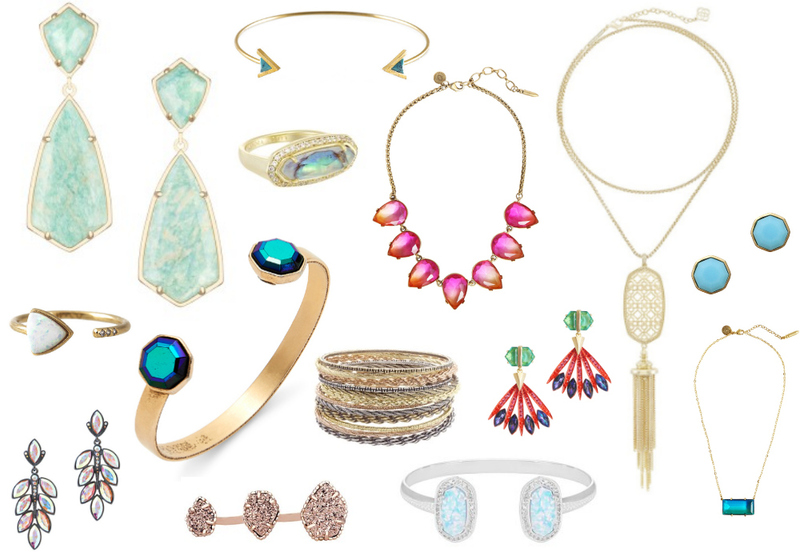 That's all of the jewelry that I would love to get my hands on to pair with summer outfits! I am adoring pretty colored jewels and cuff bracelets for the upcoming season, as you can probably tell. I'm sure that most of these gorgeous pieces will remain a "wish" because of their price tag, but they are perfect for inspiration, and for making me even more pumped for sunny days by the beach. I hope you enjoyed my post! Are there any pieces of jewelry that you're after? What are your favorite brands to buy from? Let me know in the comments down below!